We are starting several new Block of the Month projects in 2017. Here's the first two. Check them out! 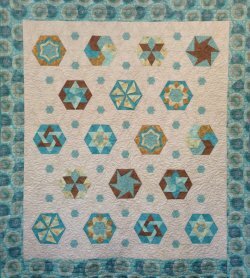 Starts January 11th - Nine blocks plus a Finishing Kit (backing not included) - 10 months total. 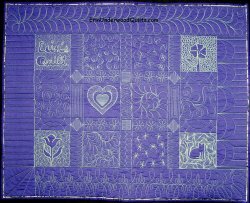 The quilt finishes 67" x 76". And each block debuts with its own 3-hour class! The 2nd Wednesday of every month 6 - 9 pm! All for $19.95 a month. Two color ways to choose from - Beautiful teals and tans or bold batiks! Call or come in to the Blue Hen to sign up now! This stunning 10 month project starts in February! 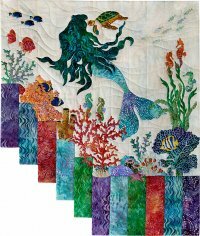 This 66" x 80" quilt uses thread painting for fusible applique! 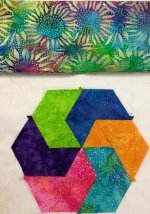 Start this project with Jody on Saturday, February 4th at 11am with the kick-off workshop! Nine months of fabulous floral blocks and then get back together with Jody for the finishing kit techniques! $28.95 a month. 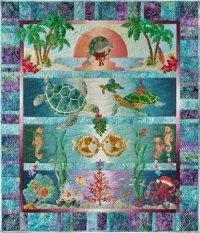 Look for details about our new Hand Applique and Paper-Piecing Block of the Month clubs in the January newsletters! This month our Special Ruler is the Creative Grids 6-1/2"x 12-1/2" Ruler! This is a staple for every sewing room! Perfect for cutting smaller shapes and strips. And there's quite a few interesting free patterns for you to choose from with your purchase of this handy-dandy little ruler! This ruler is perfect for those of you who prefer to cut your strips with the fabric folded twice. Just the right size and the non-slip grip keeps all those strips straight! 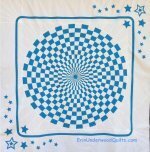 Love this White Out Fabric! Beautiful white on whites, grays on whites and taupes on whites! Sand-dollars, snowflakes, leaves and lace are just a few of the patterns. 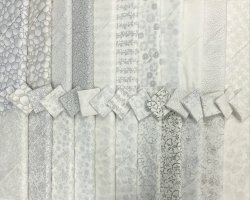 And check out this free pattern from Northcott featuring the White Out Collection! Cascades Easy yet elegant! And you know we love batiks at the Blue Hen! Here's a little something new from Batik Textiles and Hoffman. 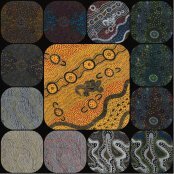 New Australian designs. Don't you think this picture collage John created makes a great quilt?! New patterns too! Tired of your traditional Christmas tree! Try this one on for size. And you can add lights! We've got it all kitted up for you - no need to think about fabric - just get sewing! 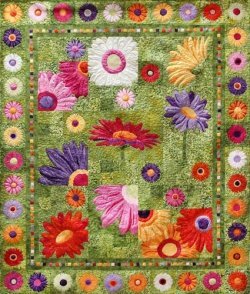 And Mekenna Ryan is new to the shop - love these patterns! We do not have any more classes scheduled in December as we know you are busy finishing up your holiday gifts... So we are turning the rest of the Fridays and Saturdays in December into Sewing Bee days! Come in and finish those Christmas gifts with uninterrupted sewing time! Or just come in to have a fun day with friends. We will provide the hot chocolate and tea - you provide the sewing, creating and of course, fun! All supplies included for this practical project! 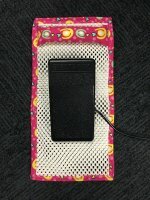 Just bring your sewing machine and basic sewing stuff to make this clever item that keeps your sewing machine pedal from slipping! After this class, you will be done with having to constantly put your pedal back where it belongs! Need to figure out the best way to finish off that quilt. We will be doing simple binding techniques that include turning corners, joining ends, flanges and even finishing it all be machine! 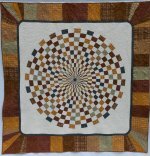 Strip piecing and the Creative Grids 15-degree ruler makes this quilt spin! Go two color or calm it down with a scrappy look! The Blue Hen will be closing at 2pm Saturday, December 24th and opening again Tuesday, December 27 at 9:30 am. We hope to see you before Christmas but if not, we wish you a wonderful holiday season with your family and friends! As our son used to say - Happy Christmas! !